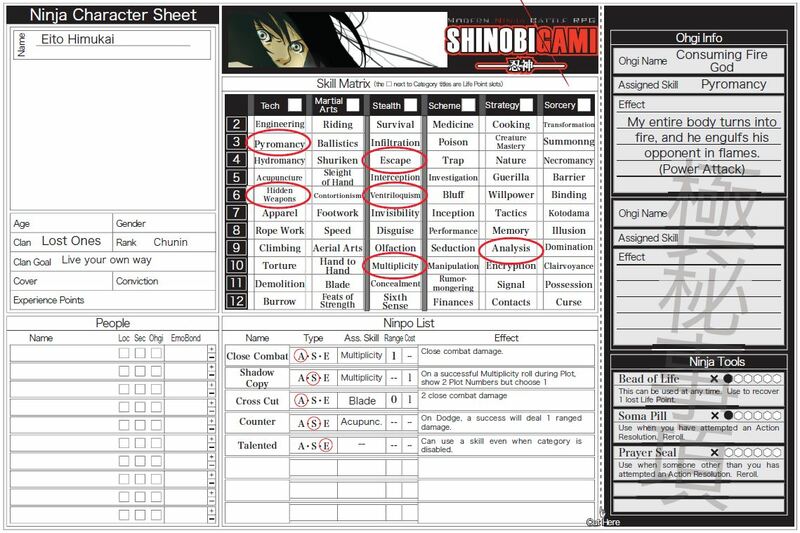 Shinobigami doesn’t have lots of small rules to memorize: The most important rules are related to elements found on the character sheet. 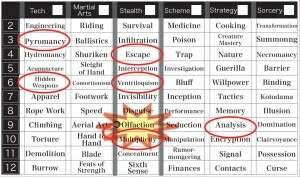 Let’s take a brief walk through a typical Shinobigami character sheet, which hints at the core rules of the game. In Shinobigami, there are some unique procedural rules to remember, but similar to contemporary board games, the core of everything you need to manipulate and use is written out entirely on the character sheet. Eito is a member of the Lost Ones, ninjas who specialize in stealth and secrecy. 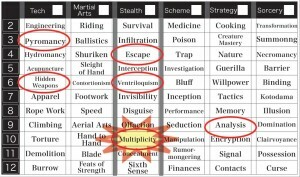 The “Stealth” category of skills are his primary skills, so his player selects three skills from this column. Then, he picks three other skills that he thinks makes his character interesting. For strategic reasons (which you’ll understand when you play the game), Eito’s player has spread the chosen skills out around the grid a bit, though there is a pretty open area in the top right. 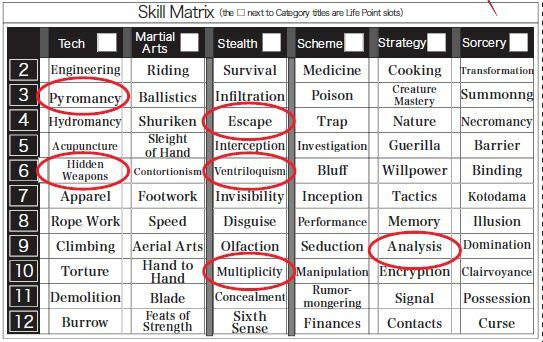 In each scene in Shinobigami you can do many things, but there is only one single skill roll, which is made when you advance the game. When you make a skill roll, you usually use one of your skills, and roll two six-sided dice: If the dice come up 5 or higher, you succeed. 1-1 is always a failure, and 6-6 is always a success. On the left, Eito uses a technique to make it look like there are multiple copies of himself, called Multiplicity (or in Japanese “Bushin no Jutsu”), in order to distract his opponent and discover her Secret. Since he already has the skill, he just needs to roll 5 or higher to succeed. In the middle, Eito’s player later decides to change it up: His opponent escaped down an alley in a narrow maze of alleys and shops. He tries to use his Olfaction skill to try to find her location. He doesn’t have the Olfaction skill but it’s only one box away from Multiplicity, so he adds one to the difficulty: A result of 6 or higher on two dice is a success. Ninpo (Ninja Arts) are the special abilities that each ninja has, which they use when fighting each other in battles via the Velocity System. 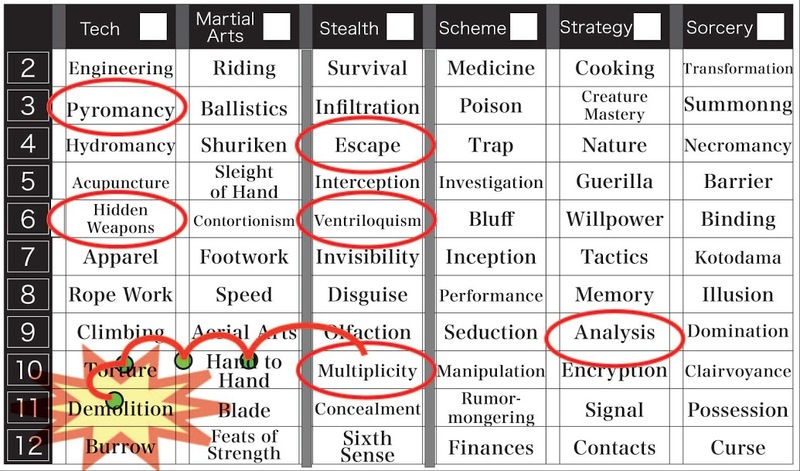 Every ninja has “close combat”, a weapon skill that inflicts damage at close range. There are many ninpo in various categories (attack, support, and extra), including some ninpo which only members of a specific clan can use; most also are assigned to a skill on the grid. Choosing versatile ninpo is extremely useful when making a character, as they can aid you in many situations or help protect your weak points, while at the same time assisting your friends/teammates. There’s a lot of extremely interested emergent behaviors when using and combining ninpo… see for yourself when you buy the game! …Eito will check the relevant box. EmoBond represents one of the most important core elements of the game, the actual relationship between two characters. 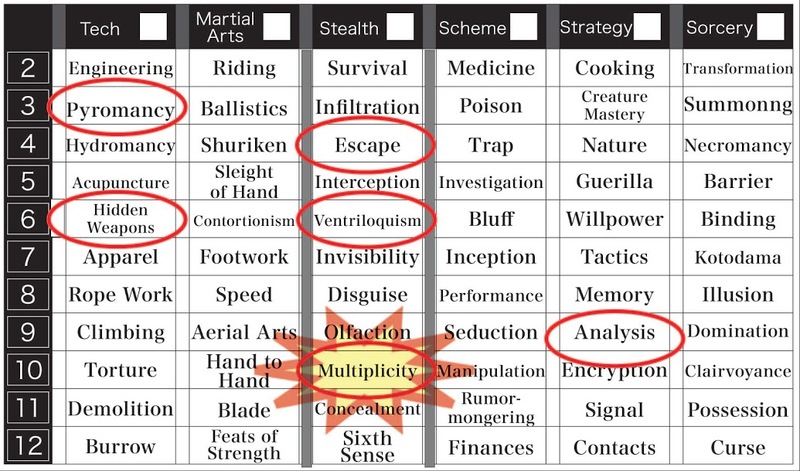 When you form a relationship with another, each player rolls a die and consults a table which lists off one positive and one negative relationship (Friendship vs Anger; Devotion vs Murderous Intent; etc). Each player picks one that they think fits, depending on how the characters have approached each other, and on their own goals. 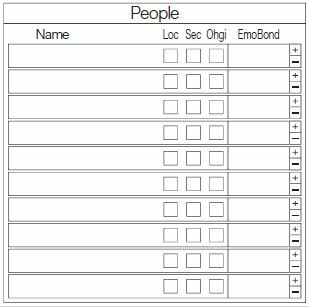 These are written down under “EmoBond”, and can later change (you can also make someone else’s relationship with you change to whatever you wish by defeating them in battle). From that point on and for the rest of the game, if anyone you have a direct EmoBond with learns the Location or Secret of another character, you automatically receive that information, too. You can also give that character +1/-1 to their skill checks as you cheer or jeer them from the sidelines, or secretly assist them from the shadows. The Secrets (secret goals and backgrounds) the GM hands out to the characters are not written on the sheet, but rather given in card form; the player reads it and hides it under their sheet. There is a secret side of the sheet that you either cut and hide under your sheet, or fold back. This section contains the Ohgi and Ninja Tools. 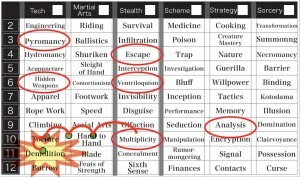 Ninja Tools are simple trick items that let a player instantly heal a point of life (Bead of Life), to reroll a skill roll (Soma Pill) or force another player to reroll (Prayer Seal; including making friends reroll botched rolls to try to make them succeed, or enemies reroll successes to try to make them fail). The Ohgi (“Secret Technique”) is the ultimate supreme ninja art that your shinobi character has mastered, that is a secret to everyone. There are a few categories of Ohgi (mostly to do massive amounts of damage; or else other things like regeneration, skill boosts, etc). Each player chooses a category of Ohgi, then authors the name and effect of the Ohgi themselves: When they utilize it, the player indeed has to shout out the technique as they do it (“Consuming Fire God!!!”). After they unleash their technique the first time it cannot be stopped or blocked, but everyone else in the scene marks it down as “Learned”. From that point on, that character can try to roll to cancel your Ohgi if they are in the same scene! Those are the basic character-driven rules. 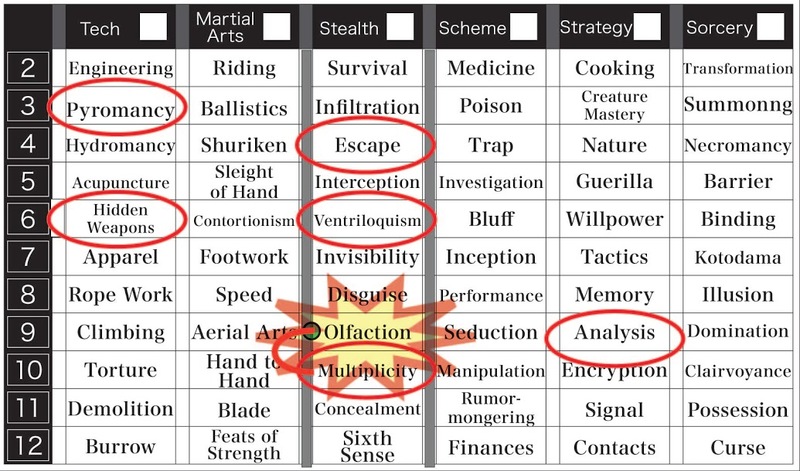 There are other procedural rules and the like which turn the game from “just a bunch of skills and ninja powers” into a high powered tight story-creation engine. Check out the book to learn more!